FinTrU do an incredible job of cultivating a sense of community in their workplace through the use physical activity. Staff are encouraged and given the resources to experience the very many work related benefits that regular exercise can bring, with our long running weekly yoga classes obviously a personal fave of mine. I was chuffed to spend Friday morning like a Britains Got Talent judge shifting through the very many incredible entries. Everything from mindful lunchtime walks, to rollerskating at the mac, to cha-cha-sliding HIIT classes, to total wipeout @wearevertigobelfast , to yoga classes, to youtube worthy coordinated videos with tennis balls. We obviously chose winners (and worthy ones at that) but the biggest takeaway from the initiative for me was CORPORATE WELLNESS WORKS! Staff love it and everyone benefits. If you are thinking of adding exercise or yoga classes to the workplace, or would just like a chat about how getting your staff moving may be of benefit, check out my Wellness at Work section, or get in touch - I’d love to help. Spiiiiiinathon! Club Vitae, Fitness Belfast, and Pudsey! If you happened to pass by the Clayton Hotel Belfast on Monday, you’re eyes weren’t deceiving you - those cyclists were not the normal city centre bikers! The average person sits for 9 hours a day! Could two minutes of yoga be the answer? W E L C O M E T O T H E G A M E S! An old school sports day for PR whizzes Smarts Communicate! 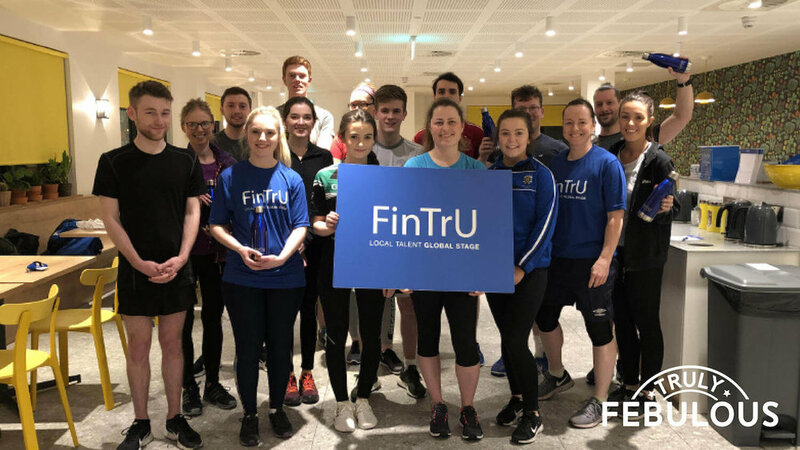 I am thrilled to have spent the last 6 months working closely with FinTrU on their Corporate Wellness initiatives. FinTrUFlo Corporate Wellness & pool tables! Newer PostCoconut Bacon - eh... what?